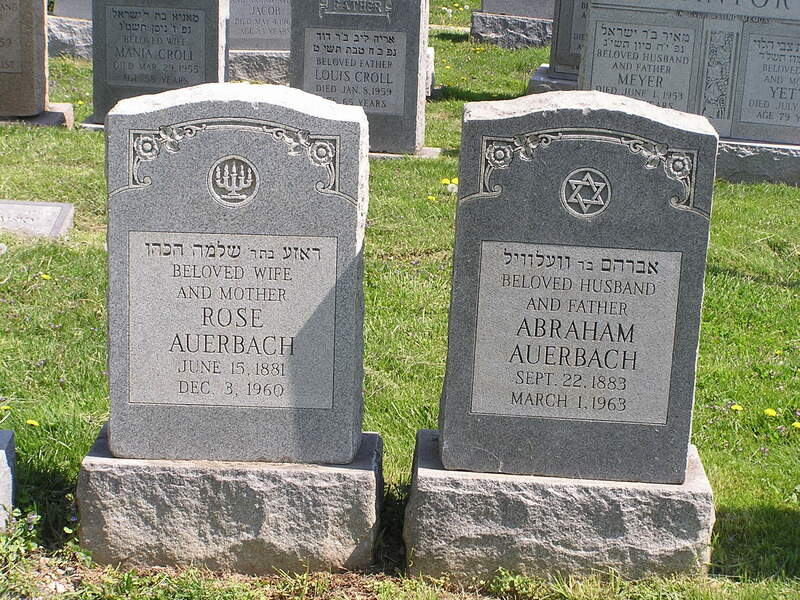 Abraham and Rose Auerbach. Philadelphia. Year 1954. Velvel’s pupils, private and yeshivah, disappointed him. “Never become melameds,” he warned his sons. “No profession is less rewarding: you give your heart to convey precious knowledge but it doesn’t penetrate your pupils’ minds. All you get at the end of the day are a sore throat and not enough money to put food on the table. But,” he always noted, “every Averbukh branch produced at least one melamed.” We will never know what branches he referred to. One pupil that did not disappoint Velvel was his oldest son Avrum (Avrimele to everybody but not to Velvel who frowned at using diminutive names unless they were deserved which did not seem to ever happen.) Not as tall, he was otherwise a copy of Velvel both in appearance and ability, homeschooled by him, his pride and hope, the heir apparent. Avrum’s teenage years fell on the chaotic start of the twentieth century in the Russian Empire. For him and most Jewish youth cooped up in shtetls, the urge to annihilate the old order took priority over everything else. Socialist, bolshevik, anarchist—labels meant nothing to him. Passionate revolutionary speeches made no sense, and could lead to nothing good, considering that the fervent listeners consisted of the uneducated and the gullible. They would throw aside tradition – and then what? Avrum was not to be swayed by his father’s fury over the desecrated books. He lectured Velvel on the merits of anarchism. He recommended to walk away from the doomed world of yesterday, along with its Torah, and to read more relevant literature. Cautioned repeatedly of the power of a word, Avrum’s siblings faced for the first time an inconceivable dramatic transformation that words had brought about in their thoughtful, brilliant brother – they carried the fear of those words through their lives, they instilled it in their children. Already displeased that Avrum had found his own match, Rose Nikolayevskaya, a daughter of a balmalukhe, thus diminishing his chance of having scholarly offspring – ven ikh makh a shidduch meine liebe zol haben a zein mazel, ven meine kinder makhen a shidduch meine sojnem zol haben a zein mazel (when I make a match for my children my loved ones should have such luck; when my children make a match themselves my enemies should have such luck) – Velvel could not forgive his son’s turning his back on his tradition. Not just a son, a shining star, an heir to everything held sacred. “Now you are an anarchist, then you’ll become a sitsilist, then you’ll become a murderer” – an insight on his country’s path too visionary for most of Velvel’s contemporaries, drunk on utopian dreams, to comprehend. In 1906, Avrum followed the family of his bashert to the United States. He ended up in Philadelphia where, based on documents we discovered, another Averbukh branch had arrived earlier. He became Abraham Auerbach and raised three children. In the beginning, he worked third shift at a factory as a weaver and a presser. During the day, he wrote. In later years, Avrum became an insurance agent and taught at the Gratz College, a school for Jewish studies in Pennsylvania—a melamed, after all. Anarchism discarded, he turned to Zionism. In the early 1960s he spent several months in Israel. Avrum had expected a show of reverence there that befitted a scion of a renowned rabbinical dynasty but if his lineage elicited any recognition it must have been muted. He did not share his impressions, or any information, with his children. 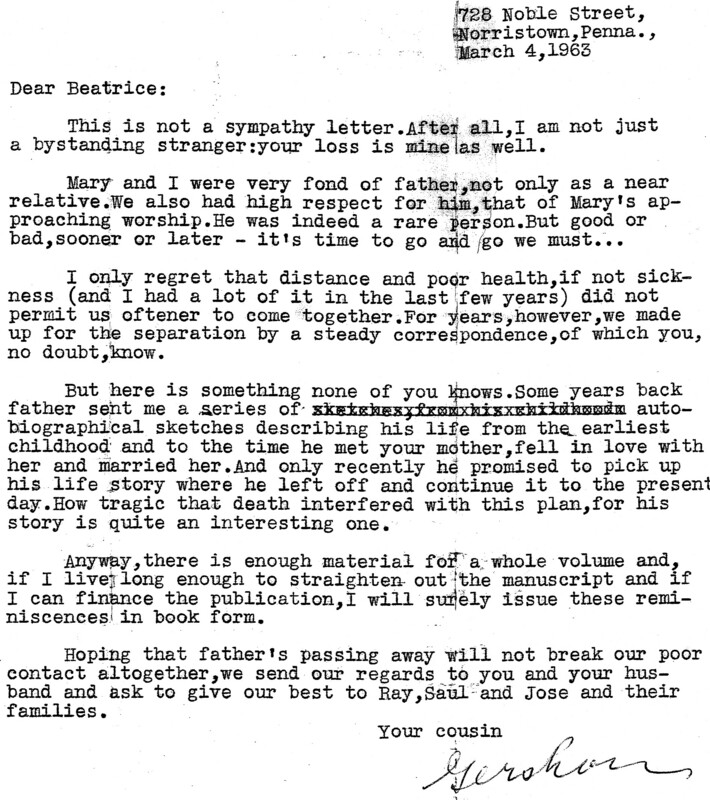 Shortly before his death, Avrum completed the Averbukh family history, a fact we learned from a letter sent by an unknown cousin to one of Avrum’s children and uncovered a half-century later. That cousin intended to publish Avrum’s manuscript which had been left with him for safekeeping but he died before he could do it. The manuscript was lost. Avrum died in Philadelphia in 1963. 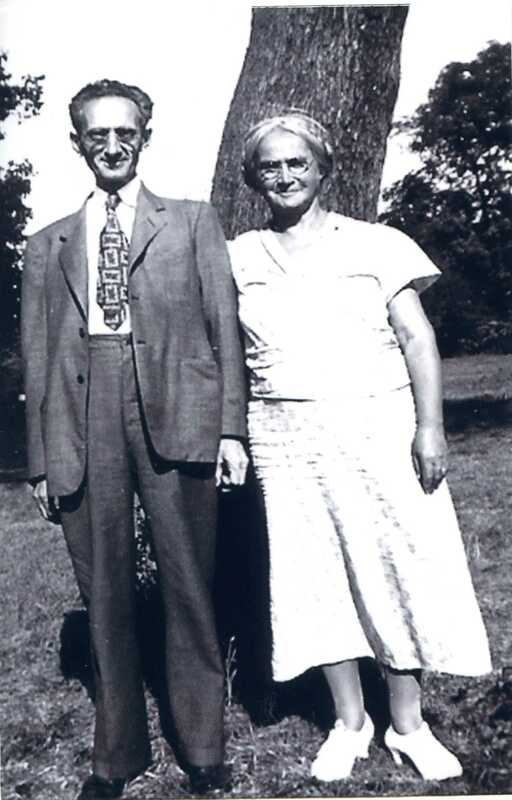 In 1975, twelve years after Avrum’s death, the first of the old-country Averbukhs immigrated to the United States and sought out the Auerbach cousins.